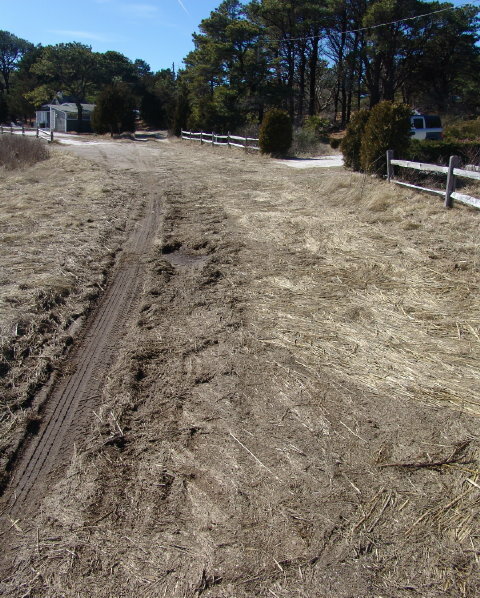 Late February and early March storms battered Outer Cape Cod causing substantial waterfront erosion on both ocean and bay sides. Under bright sunshine on Saturday, the remnants of these storms still endured with breakers crashing along the nearly 30 mile Great Back Beach. Enormous gouges have been ripped out of the towering Atlantic coastal sand banks. On the bayside, erosion has been equally destructive. 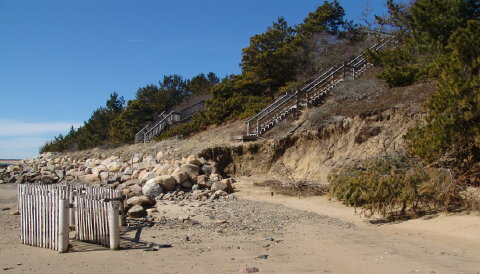 At the south edge of the Indian Neck sea wall, ”scalloping” has cut deeply into the bank and now threatens the wooden stairway. Despite supposedly protective tidal fencing, trees have been ripped from the bank by the erosive force of winter storms and flood tides. 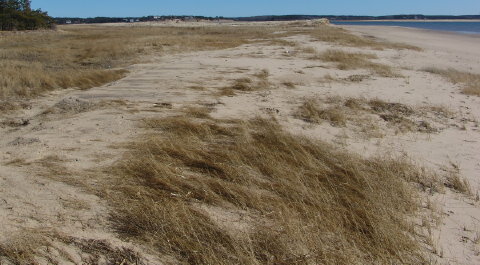 Nearby, this winter’s continuous overwash of the foredune along Indian Neck’s Blackfish Creek shore has transformed the salt marsh habitat previously protected behind it. Repeated storms and flood tides soften and threaten the extremely productive terrapin nesting sites along Marsh Road on Lieutenant Island’s south shore. Tidal wrack has been strewn along the roadway and into abutting yards. 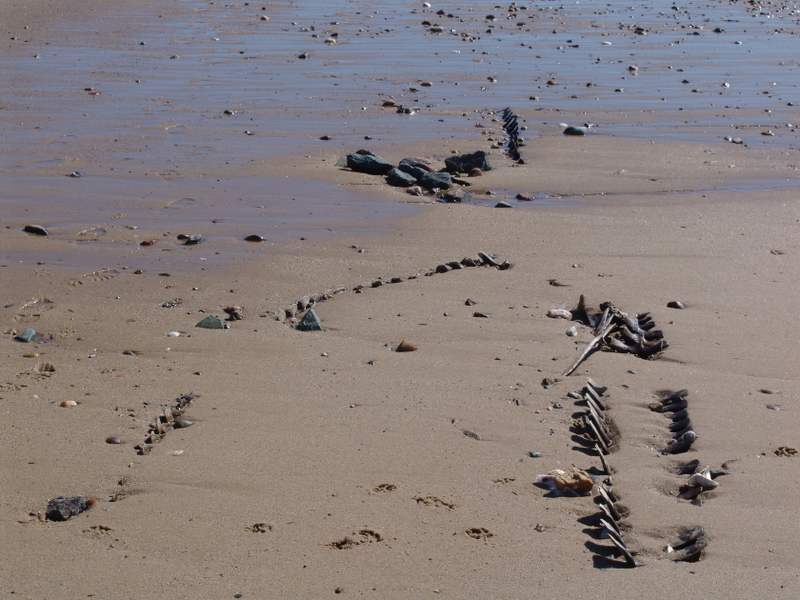 Turtle Journal has not previously seen such erosion in the last dozen years. 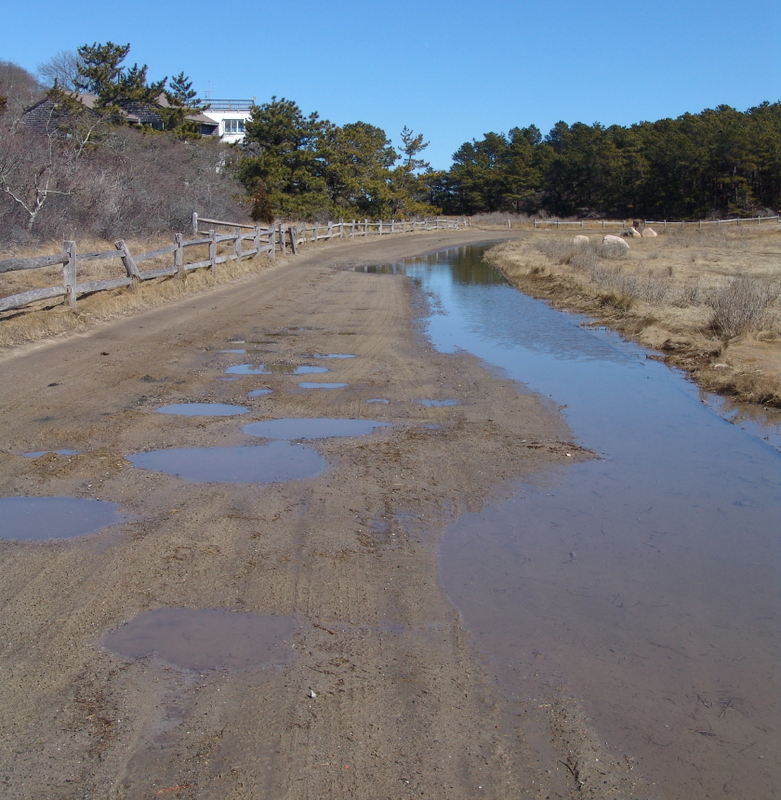 Tides similarly assaulted the roadway connecting the first (east) and second (west) islands with significant erosion and softening. On the west shore of Lieutenant Island, four more pilot whale skeletons have extruded from the sand with winter battering. 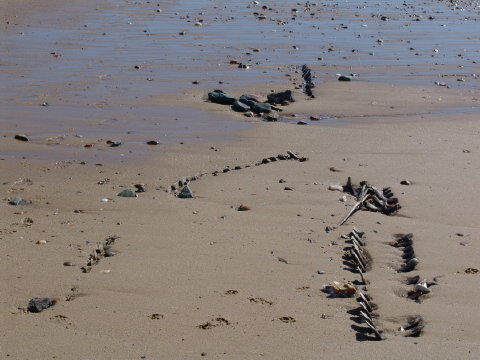 See the earlier Turtle Journal posting, Whale Bones Rise from Sands of History, from late January 2010. Halloween! The sweetest, most inventive American holiday arrives in a mere two weeks. Halloween was once dominated by roving gangs of ghosts and goblins squealing the churlish threat of “Trick or Treat,” a menacing phrase eeriely reminiscent of the old British highwaymen’s “Stand and Deliver” or the 20th century mugger’s “Your Money or Your Life.” But America’s greatest cartoon genius, Charles Schultz, rescued Halloween from ghouls and gangsters, sprinkled it with child-like purity and gave us back our innocence. 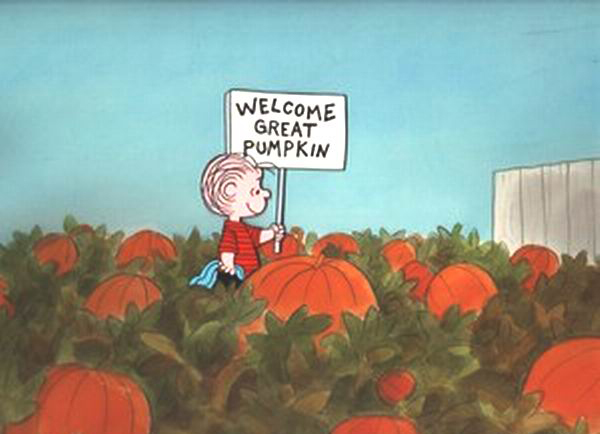 So, each October we search the far landscape for the most perfect pumpkin patch where the Great Pumpkin will appear to the purest of heart. A snipe hunt? No way. Even if we suspected that Charles Schultz had tried to pull one over on us, Linus would never try to deceive. And even a snipe hunt offers opportunities for fresh air and the beautiful Cape Cod countryside. 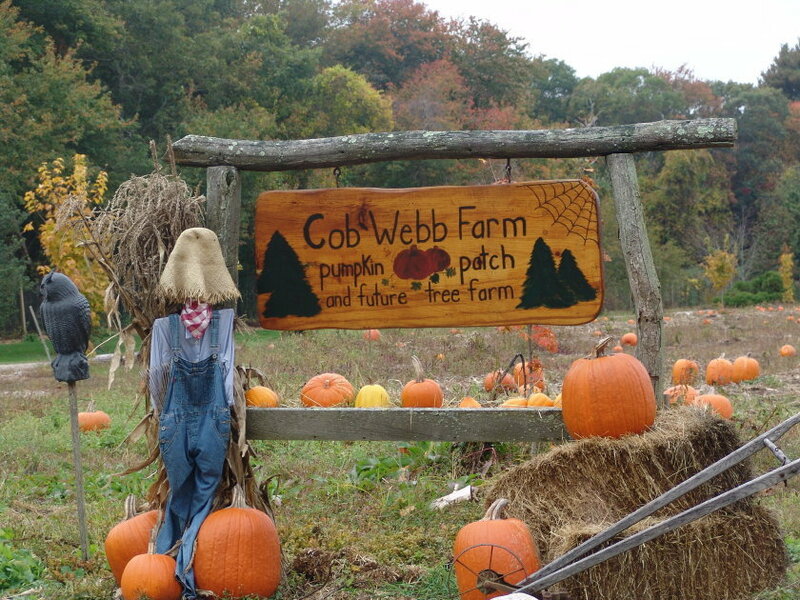 On Wednesday we drove out into the woodlands of Marstons Mills on the Upper Cape and spotted the Cob Webb Farm pumpkin patch. We were the only patrons with acres and acres of pumpkins to survey, selecting a perfect 25-pound orange globe as the Halloween welcome sign for our front porch. Not all pumpkins are for carving, but they are revered nevertheless. A neighborhood squirrel stumbled across the decorative pumpkin we placed on our front banister to invite youngsters for a sweet Halloween feast. Even this bushy tailed rodent morphed into a cuddly Schultz-like creation, transformed by a Halloween pumpkin into cartoon purity with eyes swelling, arms trembling and heartbeat racing so fast that its chest vibrated like a base drum. Well, you may have thought you’d get through an entire post without that pesky science stuff. No such luck. While we were walking through the Cob Webb Farm patch and inspecting orange orbs, we found a slew of spotted cucumber beetles (Diabrotica undecimpunctata) feasting on stems and crawling around pumpkins. 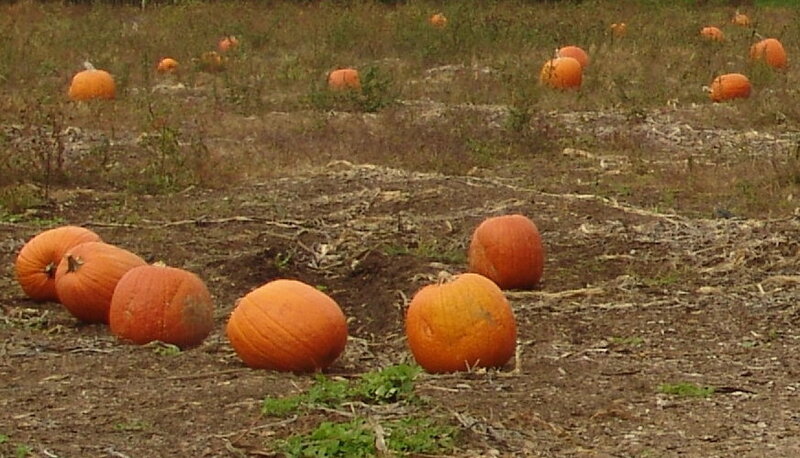 Their dorsal color blends perfectly with the surface of the pumpkin, turning them invisible to the untrained eyed. We also found a few striped cucumber beetles (Acalymma vittatum) that had embedded themselves into the surface of the pumpkin. Both spotted and stiped cucumber beetles cause significant damage to cucurbit crops, including plants like cucumbers, squashes, pumpkin gourds and melons. To balance the science we’ll close this post with a photographic melange of a very talented cucumber beetle that appeared engaged in a complex, acrobatic break dancing routine. You are currently browsing the archives for the Trees and Vegetation category.